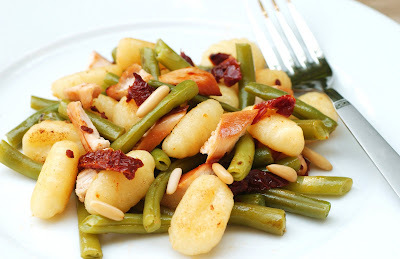 I'd like to share another of our favorite dinner dishes: a one-skillet dish with Italian potato dumplings, grilled chicken and green beans with some natural flavoring through sun-dried tomatoes and toasted pine nuts. We have had this for so long, I can't quite remember how we got this together. If I am not mistaken, it stems from the time when I was pregnant and were constantly hungry for green leafy vegetables. The original recipe was vegetarian and with Brussels sprouts. I fed them to family until everyone was overdosed on them. At that time I played around with other green vegetables and we stuck with the green beans. The vegetables are surely replaceable though I'd stick to green ones. We tried mushrooms and it didn't quite work. The pine nuts are also replaceable by other nuts like walnuts. And the chicken, of course, can be omitted altogether. Marinade the chicken breasts in soy sauce for at least 20-30 minutes. Grill chicken breasts in the oven for about 10 minutes, turn them and grill for another 5-8 minutes or until cooked. Set aside and let cool. Cut into bite sizes, once you can handle them. Clean the green beans by cutting off the ends. Cut the beans into 1-inch pieces. Steam over boiling water for about 10 minutes. Take of the heat and set aside. Cook the Gnocchi according to instructions. Drain them. Toast the pine nuts on medium heat in a dry pan for about 5 minutes. Set aside. Chop the sun-dried tomatoes. Heat butter in a deep saucepan. Add the rosemary. Stir in the drained Gnocchi. Keep stirring until they become slightly golden. Add the chicken pieces, green beans and sun-dried tomatoes. Stir gently until everything is heated through. Season with freshly grated nutmeg and salt to taste. Stir in the toasted pine nuts. Serve immediately.